High Representative Mogherini congratulated Minister Kishida on his reappointment, and expressed strong appreciation of his visit to Brussels at an early date following his reappointment. She stated that Japan is a strategic partner for the European Union (EU), and she would support Japan in playing a more active role for the peace and stability of the region and the world. In response to this, Minister Kishida congratulated Ms. Mogherini on her appointment as the High Representative, and stated that Japan had pledged never to wage a war again based on the reflection of the past World War, and, as a peace-loving nation, has made great contribution to the peace, stability and prosperity of the international society over the 70 years since the end of the war, and Japan’s orientation as a peace loving country would never sway. Minister Kishida also stated that the EU is an important and credible partner with whom Japan can act together and that Japan would closely cooperate with the EU for the further enhancement of their relationship under the new EU administration. A. 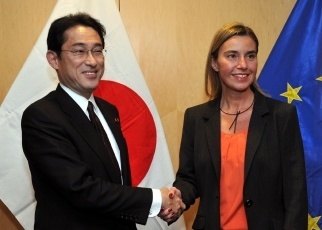 Minister Kishida and High Representative Mogherini confirmed that Japan and the EU welcome of the development of their relationship, such as frequent meetings between leaders and foreign ministers, and, in the year that marks 70th year of the end of World War II and the 40th year of the adoption of the Helsinki Final Act, would contribute in tandem to the peace, stability and prosperity of the international society as global partners sharing fundamental values such as democracy, human rights and rule of law. B. Moreover, Minister Kishida and High Representative Mogherini agreed to promptly arrange the date of the next Japan-EU Summit Meeting with a view of holding the Meeting in the first half of this year. A. Minister Kishida and High Representative Mogherini confirmed that based on the agreement between leaders at the 22nd Japan-EU Summit Meeting held last May, concrete follow-ups are implemented in each field. B. Minister Kishida expressed his gratitude for the EU’s support for Japan’s “proactive contribution to peace” and a Cabinet decision on the basic policies on the legal basis for security. At the same time, Minister Kishida welcomed collaboration between the EU’s Common Security and Defense Policy (CSDP) missions and Japan’s assistance and joint exercise for anti-piracy operations between the Japanese Self-Defense Forces and EU Navy Force in the Gulf of Aden. C. Regarding the Japan-EU Economic Partnership Agreement (EPA), Minister Kishida stated that as agreed in the Japan-EU Summit Meeting last November, he wished to accelerate negotiations together, aiming to reach agreement in principle during this year. In addition, Minister Kishida requested the EU to ease and lift restrictions on food imports from Japan, on a scientific basis, which have been maintained since the accident at the Fukushima Daiichi Nuclear Power Station. D. Minister Kishida welcomed the first Japan-EU dialogues concerning cyber and space policies held last October, and called for attendance of a high-level EU official and cooperation for the success of the Third UN World Conference on Disaster Risk Reduction. Moreover, Minister Kishida stated that the Japan-EU Strategic Partnership Agreement (SPA), which will form a foundation for further strengthening the broad-ranging cooperation, is important to render the Japan-EU relationship more enduring and higher level and wish to work together with the EU for its early conclusion. E. In response to the above, High Representative Mogherini affirmed numerous positive developments, and stated that the next Japan-EU Summit would be an occasion to underline such positive progress in the Japan-EU relationship as well as to support the on-going negotiations on two agreements. High Representative Mogherini added that the next Summit Meeting would be a good opportunity to demonstrate a strong cooperative relationship between Japan and the EU, including affirming the roles assumed by Japan and EU for the peace and security of the international community. High Representative Mogherini explained the discussions concerning measures against international terrorism at the Foreign Affairs Council of EU held on the day. In response to this, Minister Kishida stated that the terrorist attack in Paris could not be tolerated for whatever reason and should be firmly condemned. Minister Kishida also said that this attack heightened his conviction that the fight against terrorism is a challenge which international community should continue to address with all its strength and he would continue close cooperation with the EU for this purpose. Minister Kishida and High Representative Mogherini exchanged views on the situation in East Asia and confirmed their close collaboration regarding human rights issues including the problem of abduction by North Korea. Minister Kishida highly appreciated the efforts by the EU for the reform and economic modernization in Ukraine and stated that the Government of Japan, would actively work on the situation in Ukraine, emphasizing the unity of G7 and in collaboration with the EU. High Representative Mogherini explained the EU’s efforts and relationship with Russia, and stated that EU would tackle the situation in Ukraine while obtaining the solidarity of the 28 EU countries, the unity of the G7 countries, and cooperation from as many countries as possible. Finally, Minister Kishida and High Representative Mogherini agreed to exchange views closely, taking advantage of various occasions such as the G7 Foreign Ministers Meeting scheduled in April.